Earlier this month Australian Prime Minister Tony Abbott sounded a warning on the impact to Australia’s economy if the recently signed China-Australia Free Trade Agreement were to fail. Economic modelling for the Department of Foreign Affairs and Trade by the Centre for International Economics (CIE) demonstrates the gains of the agreement will be modest. The CIE estimates the gain in economic welfare from the three North Asian FTAs (the recently activated agreements with Japan and Korea and the agreement with China awaiting parliamentary ratification) will be 0.4%. We could call this an annual boost in welfare of A$3 billion or A$300 per household or A$130 per person. If we want an impressive number we could work out the present value of a A$3 billion annuity, and call the gain A$50 billion. All of these numbers are being quoted by proponents of the agreements. But whatever way we dress it up the gain is still 0.4%. The FTAs will give Australia a welfare gain because they will enable Australian firms to receive higher prices for their products in the three North Asian countries. The main reason is that these countries already have agreements with some of Australia’s competitors, including New Zealand. If the Chinese tariff on beef is 15% for non-FTA partners, then, in the absence of the China-Australia FTA, for Australia to compete with New Zealand in the Chinese beef market the Australian pre-tariff price (the price received by Australian producers) must be 15% less than the New Zealand price. When Australia becomes an FTA partner with China, it can edge up its pre-tariff price towards that of New Zealand. The FTA tariff reductions by the North Asian countries that will significantly benefit Australia are confined to a few agricultural products. For example, in the China-Australia agreement, Chinese tariffs on imports of Australian dairy, beef, lamb and wine all fall by more than 10 percentage points. In total, the CIE estimates that the FTAs will give Australia an increase in the prices it receives for its exports of about 1.2%. With exports being only a fraction of GDP, this translates into a welfare gain of 0.4%. Proponents of the FTAs claim they will create jobs. Trade Minister Andrew Robb has said Australian jobs would grow by 9,000 per year to be 178,000 higher in 2035. This is incorrect. The CIE study says the agreements will cause jobs to be 5,434 higher in 2035. It seems that Robb erroneously derived his figure by adding the employment effects in each of the 20 years and assigning the grand total (178,000) to 2035. Despite assertions to the contrary by our political leaders, FTAs are not primarily about jobs. Aggregate employment depends on macroeconomic conditions, particularly the balance between real wages and productivity. The path of employment over any period longer than a couple of years will be determined independently of whether or not Australia completes the trifecta of North Asian FTAs by ratifying the agreement with China. As with other favourable microeconomic policies, the FTAs with the North Asian countries are about improving wage rates by increasing the value of what Australian workers can produce. The CIE projects a long-run real wage increase in Australia from the agreements of 0.3%. As well as goods and services trade, the three FTAs deal with foreign direct investment (FDI). CIE’s view is that there will be no discernible effect on inbound FDI for Australia. The China-Australia FTA may encourage Australian outbound FDI in the Chinese service sector, but it is doubtful this will have a noticeable effect on the welfare of Australian households. Why are FTAs such hot political issues? Lack of community understanding often creates controversy over trade policies. These policies are often blamed for structural adjustment problems that arise from other factors such as appreciation associated with the success of our mineral industries. But even when they are understood, trade policies are contentious because they are approximately zero-sum games. There are domestic winners and losers, and although the national welfare gain is not zero, it is usually small. Unlike a good health or social policy, which can make everyone a winner, a trade policy tends to pit the interests of one part of the community against those of another. Australian winners from the North Asian FTAs are industries producing agricultural and related downstream products subject to substantial reductions in Japanese, Korean and Chinese tariffs. This is illustrated in the right-hand panel of the chart below. 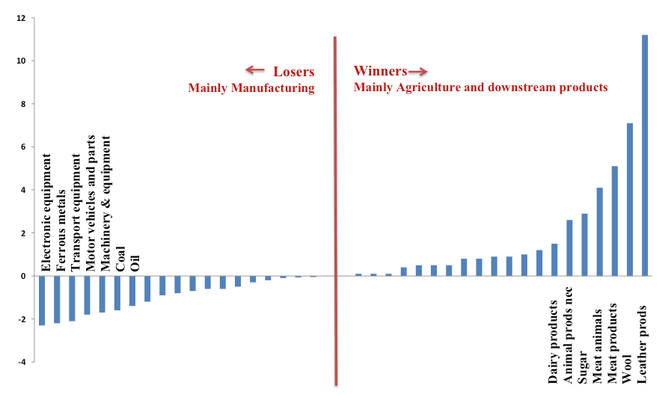 The losers are mainly in manufacturing (left-hand panel). For them, the main negative impact is via the exchange rate, which appreciates in response to increases in agricultural exports and the terms of trade. Appreciation hurts import-competing manufacturing industries by lowering the $A price of imports. Appreciation also explains why the CIE projects negative effects for some Australian mining industries. In the debate about the China-Australia FTA, the Abbott government is exaggerating the potential benefits. By not engaging in an evidence-based truthful discussion, the government runs the risk of creating unrealistic expectations and eventual disillusionment. This has the potential to inhibit Australia’s participation in future FTAs, which will be necessary to safeguard our competitive position as FTAs between other countries proliferate. The opposition, led by Bill Shorten, has focused attention on the labour-market aspects of the China-Australia FTA. The proposed agreement largely eliminates the requirement for businesses operating in Australia to look for Australian residents to fill vacancies before bringing in workers from China under the 457 visa program. There are many other requirements under this program that Chinese workers would still need to meet. Expert opinion suggests the liberalisation of entry requirements under the China-Australia FTA will have a negligible effect on job opportunities for Australian workers. Whether this opinion is right or wrong is not the main point here. Eliciting and testing information and analysis relevant to policies proposed by the government is a vital role of the opposition. Rather than branding Shorten as an economic saboteur, Tony Abbott would serve the community better by laying out the evidence on how the China-Australia FTA will affect the Australian economy, including the labour market.